Today has really felt like the first truly spring-like day of the year. The temperature must be about 18 degrees (63), and there is a cloudless blue sky. The lovely weather prompted me to get out in the garden and cut the grass for only the second time this season. The new wheelie bin made such a difference to this job, I can't say cutting the grass has yet become a pleasure but oh. my. goodness. it does help to be able to just dump the cuttings straight into a large green bin instead of a titchy tiny little plastic bag. 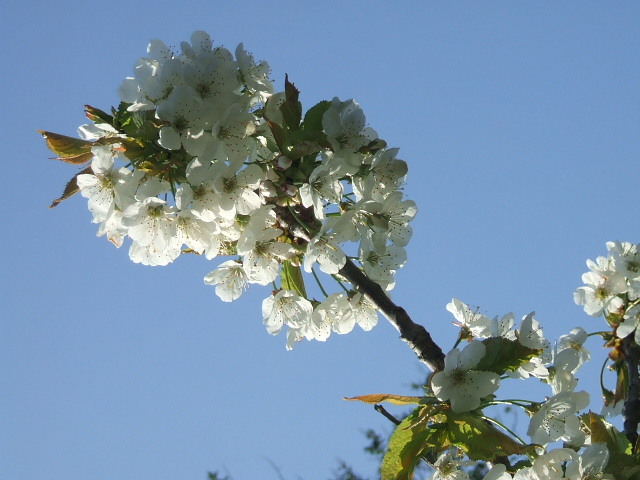 The blossom has really come out on the fruit trees and made a gorgeous sight coupled with the blue sky. 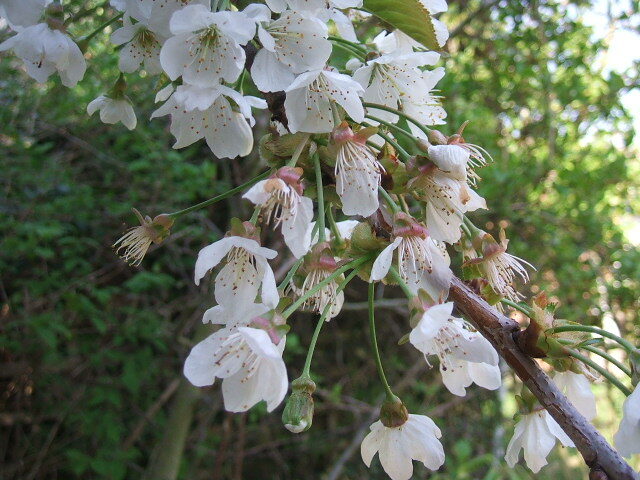 The cherry blossom is in all its glory. 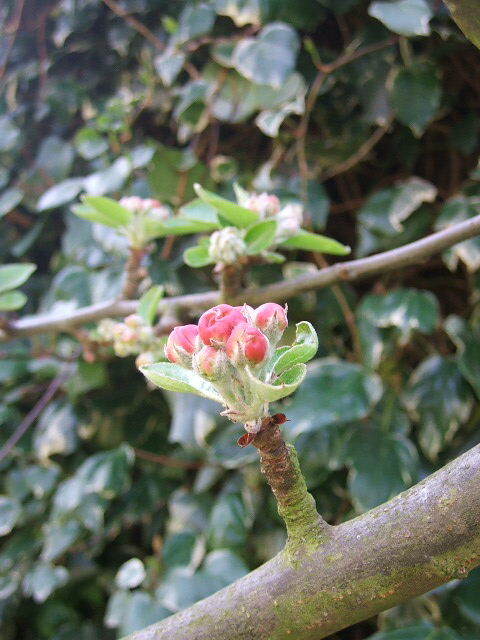 Whilst the apple blossom is still tightly furled. 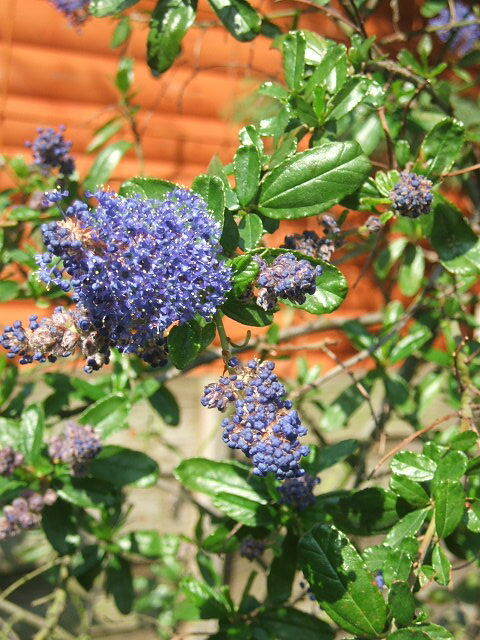 This rather splendid purple-flowering shrub is really well forward this year, a couple of years ago it didn't flower until mid-May. And I have to confess to not being 100 per cent sure what blossom this one is - it may be pear - but it is looking particularly pretty at the moment. It felt really good to feel the sun on my face as I was pottering about in the garden, hacking plants back with gay abandon and merrily throwing them into the wonderful innovation that is the green wheelie bin. All hail the mighty wheelie bin. I have such a zeal to make sure it is totally full each fortnight that my garden might even be half-way decent this summer! !